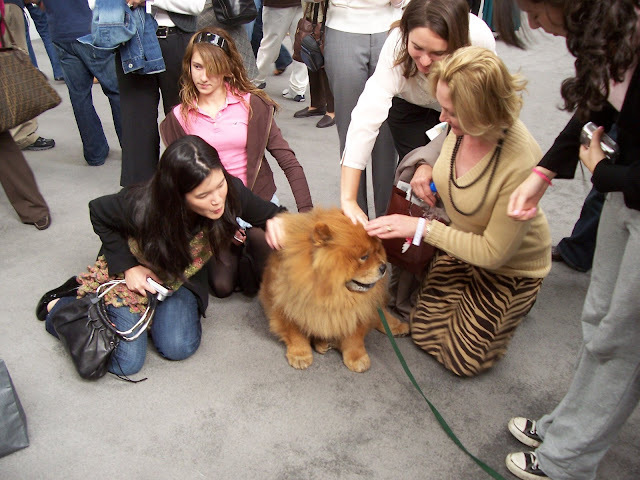 Martha's longtime companion Kublai Khan Paw Paw Chow Chow Chow passed away on April 12th. He had been a part of Martha's life for thirteen years and now rests on her Bedford property. "In addition to taking part in television commercials and several national print ads, he has been part of numerous photo shoots and is a familiar face on my television show, in my magazine, and on this blog. Paw Paw’s veterinarians, Dr. Thomas Marsh of Fairfield, CT and Dr. Marty Goldstein of South Salem, NY also admired his easy-going nature, and caring for him was never a chore. Even in his final days, Paw Paw just stopped eating and drifted off to deep sleeps, where he now rests peacefully, and, I’m most confident, quite happily. I will miss him, always." Below is a photo I took of Paw Paw at the Good Things Event in New York City in 2006. I was amazed by how well-behaved and docile he was, especially with all those people around him, fawning over him like he was a king. He'll be missed by Martha, but also by those of us who came to know him as Martha's loveable sidekick. Kings should be so lucky! Rest in Peace Paw Paw. Didn't Martha have another similar Chow before Paw Paw? I seem to remember her having one earlier than 13 years ago. Martha had had numerous Chows over the years. Paw Paw's twin was Blue Max, who died several years ago in Maine. She's had a few black Chows also. Paw-Paw, though, was her favourite, I think.